An extended takeover battle involving three of the world's most powerful media companies is culminating in the most dramatic way imaginable: An auction. Comcast is bidding against 21st Century Fox (FOX) and its powerful backer, Disney (DIS), on Saturday in an auction that is designed to end nearly two years of wrangling over control of European broadcaster Sky. 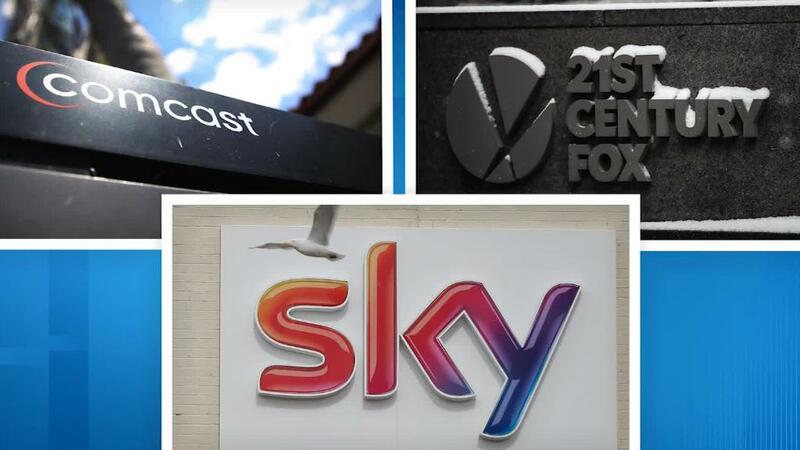 The UK Takeover Panel will oversee the rare auction, which includes up to three rounds of bidding and is designed to produce two final offers for Sky and its 23 million subscribers by Saturday evening in London. The stakes are high: Sky (SKYAY) is the biggest pay-TV broadcaster in Europe and a coveted prize for US media companies that want to expand overseas and bolster their defenses against an onslaught from Netflix (NFLX) and Amazon (AMZN). On one side of the table is Comcast, which currently holds the high bid at £14.75 ($19.00) per share — or about $34 billion in total. Its adversary Fox has offered £14 ($18.30) per share and has the backing of Disney, which is in the process of acquiring most of Rupert Murdoch's entertainment assets. Because neither side has submitted final bids, UK regulators are using an auction to bring the battle to a close. Bids will be submitted to the Takeover Panel, the offices of which are located near St. Paul's Cathedral in London, via email. The offers must be in cash only. The terms of the auction were previously negotiated and agreed by Fox, Comcast and Sky. Round One: Fox, the lower bidder, will email its opening bid to the regulator. Round Two: Comcast is next allowed to counter with an offer of its own. Round Three: If still unresolved, both sides can then submit final "sealed" bids. The Takeover Panel will then publicly announce both final offers. It could do so as soon as Saturday evening in the United Kingdom. Most analysts are expecting the bids to reach around £16 ($20.90) per share, close to Sky's current share price of £15.85 ($20.73). But some think the bids could go as high as £18 ($23.54) a share. Fox and Comcast must announce their revised offers by Monday and release a formal offer document by Thursday. It's then up to Sky's board to make a recommendation on which offer shareholders should accept. They must decide by October 11. Fox has been trying to take over the 61% of Sky it does not already own for years. In 2011, Fox abandoned an effort to take over the full company following a phone hacking scandal at News of the World, the defunct tabloid also owned by Murdoch. In December 2016, Murdoch tried again, offering £10.75 ($14.05) per share. UK media regulators put the bid through the ringer and Fox faced questions over whether it was a "fit and proper" owner and whether the deal would give Murdoch too much power over UK media. While the highest final offer is likely to be revealed Saturday, the new owner won't be confirmed until Sky shareholders decide which bid to accept. That would close a turbulent chapter for the media industry that saw Comcast lose out to Disney for most of Fox's business in a contest that appeared to be personal for Comcast CEO Brian Roberts and Disney CEO Bob Iger. -- Anna Stewart contributed reporting.